Opened in 1999, Montgomery Hospice’s Casey House on Muncaster Mill Road in Rockville is the only inpatient facility designed exclusively for hospice care in Montgomery County. It offers a comfortable, home-like atmosphere and 14 private rooms. When symptoms cannot be managed in the patient’s home, Casey House becomes a valuable alternative. Patients stay at Casey House for an average of six days and may return if they again need acute care. The Wolpoff Family Foundation has been supporting Casey House since 2009. Thanks to these gifts, Casey House is more comfortable for patients and their families. As there are no limits to visiting hours at Casey House, family members and friends often stay late in the evening, and even overnight, in their loved one’s room. Visitors need comfortable sleeping to enable a restful night. 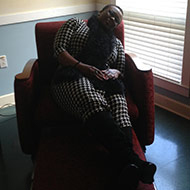 Due to limited space in patients’ rooms, a recliner chair that opens to become a flat bed is the best solution. The Wolpoff Family Foundation provided funds for sleeper-recliners in ten patient rooms where replacement of old recliner chairs was needed. Over the years, the new sleeper-recliners will serve hundreds of family members and friends of Casey House patients, and they will contribute to Casey House’s ability to provide intensive care and intensive caring to its patients and their loved ones. The Wolpoff Family Foundation also provided funds to purchase four “high-low” beds which can be lowered to seven inches from the floor and raised so that staff may easily provide care. These beds increase safety for patients who may be restless, agitated, or at risk of falling. The beds also have an auto contour feature that simultaneously raises the head and knees so the patient stays comfortably in place and is better positioned for reading, watching television, or talking to family members. Montgomery Hospice is grateful for the ongoing support and generosity of The Wolpoff Family Foundation in making Casey House more comfortable for patients, their families, and friends.